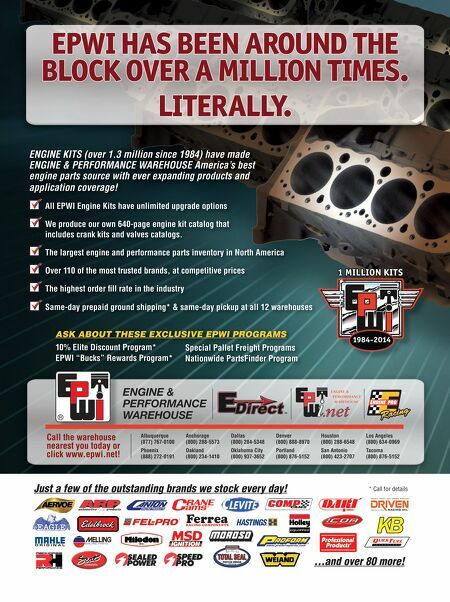 8 n Performance & Hotrod Business n February 2015 n Performance news What's new with you? Mail your news items to Performance News at Performance & Hotrod Business Magazine, PO Box 1416, Broomfield, CO 80038; fax us at (303) 469-5730; or email pbeditor@nbm.com. motor state carries Drake muscle cars Line Motor State Distributing, Watervliet, Michigan, has added the Drake Muscle Cars product line to its selection of late-model performance parts. The Drake Muscle Cars line includes billet and carbon fiber accessories, suspension components, exterior accessories, interior accessories and more for late-model Mustang, Camaro and Challenger applications, according to a press release. All Drake Muscle Cars products are now available through Motor State. 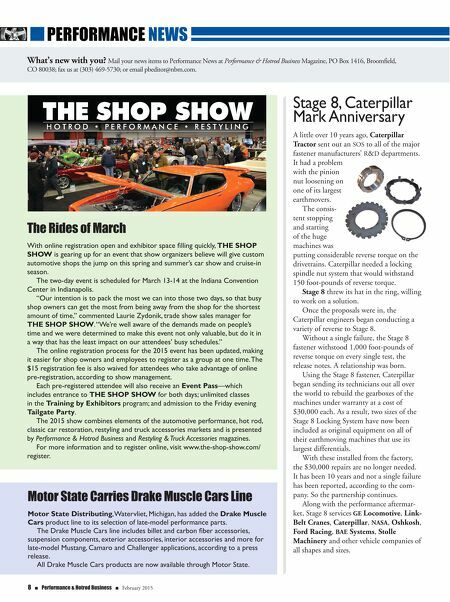 The rides of march With online registration open and exhibitor space filling quickly, THE SHOP SHOW is gearing up for an event that show organizers believe will give custom automotive shops the jump on this spring and summer's car show and cruise-in season. The two-day event is scheduled for March 13-14 at the Indiana Convention Center in Indianapolis. "Our intention is to pack the most we can into those two days, so that busy shop owners can get the most from being away from the shop for the shortest amount of time," commented Laurie Zydonik, trade show sales manager for THE SHOP SHOW. "We're well aware of the demands made on people's time and we were determined to make this event not only valuable, but do it in a way that has the least impact on our attendees' busy schedules." The online registration process for the 2015 event has been updated, making it easier for shop owners and employees to register as a group at one time. The $15 registration fee is also waived for attendees who take advantage of online pre-registration, according to show management. Each pre-registered attendee will also receive an Event Pass—which includes entrance to THE SHOP SHOW for both days; unlimited classes in the Training by Exhibitors program; and admission to the Friday evening Tailgate Party. The 2015 show combines elements of the automotive performance, hot rod, classic car restoration, restyling and truck accessories markets and is presented by Performance & Hotrod Business and Restyling & Truck Accessories magazines. For more information and to register online, visit www.the-shop-show.com/ register. Stage 8, Caterpillar Mark Anniversary A little over 10 years ago, Caterpillar Tractor sent out an SOS to all of the major fastener manufacturers' R&D departments. It had a problem with the pinion nut loosening on one of its largest earthmovers. The consis- tent stopping and starting of the huge machines was putting considerable reverse torque on the drivetrains. Caterpillar needed a locking spindle nut system that would withstand 150 foot-pounds of reverse torque. Stage 8 threw its hat in the ring, willing to work on a solution. Once the proposals were in, the Caterpillar engineers began conducting a variety of reverse to Stage 8. Without a single failure, the Stage 8 fastener withstood 1,000 foot-pounds of reverse torque on every single test, the release notes. A relationship was born. Using the Stage 8 fastener, Caterpillar began sending its technicians out all over the world to rebuild the gearboxes of the machines under warranty at a cost of $30,000 each. As a result, two sizes of the Stage 8 Locking System have now been included as original equipment on all of their earthmoving machines that use its largest differentials. With these installed from the factory, the $30,000 repairs are no longer needed. It has been 10 years and not a single failure has been reported, according to the com- pany. So the partnership continues. Along with the performance aftermar- ket, Stage 8 services GE Locomotive, Link- Belt Cranes, Caterpillar, NASA, Oshkosh, Ford Racing, BAE Systems, Stolle Machinery and other vehicle companies of all shapes and sizes.